Everyone’s favourite month is finally here! It’s all about festivities and celebrations in December, and Grand Hyatt has cooked up a line-up of year-end celebration options to help you get into the mood and wrap up 2017 on a good note. Whether you delight in a meal for two or love indulge in an all-you-can-eat extravaganza, you’ll find it here at mezza9. Be dazzled by the chefs and their culinary expertise at the live kitchens, and relish in a mix of authentic flavours including slow roasted turkey breast roulade and plum pudding as part of mezza9’s new festive à la carte menu! Love winding down at the end of the night? Then you’re going to love the Party Room, mezza9’s newest gin & tonic bar. Housing more than 40 types of premium gins & tonics from all over the world, you know you’re in for a good time the moment you step in. Get together with friends and book a table every Wednesday with the code Party88 to score yourselves a free flow of signature bar snacks, gin & tonics, and martinis for just SGD 88++. After a 4-month renovation, mezza9’s martini bar is back to spice things up with an edgy new interior, more than 30 different martinis, and a completely new bar food menu. Martini-lovers are sure to delight in the inventive and quirky martinis here, including the Candy Cane Martini or the Discotech Martini which are both created for this year’s festive season. Daily happy hours are from 5PM to 9PM, where all martinis, gin & tonics, and sustainable wines by the glass go for only SGD14++. Find it at Mezzanine Level, 10 Scotts Road, Grand Hyatt Singapore, Singapore 228211. Book a table at mezza9 and earn 2X Chope-Dollars with code TASTYBLOG. Move the turkey and cranberry sauce aside because it’s local flavours all the way here at StraitsKitchen! Enjoy a taste of home with Singapore’s most-loved classics such as Laksa, Roast Duck, Udang Masak Nanas, Popiah, Wok-Fried Crab with Spices, and more. Kick start the meal with a (sinful) plate of Hyderabadi Dhum Biryani and end the meal in the comforts of local desserts including Peranakan Kuehs, Ice Kachang, and locally-inspired ice-cream flavours such as Durian and Coconut. Whatever your palate fancies, there’s enough to entice and excite this festive season! Plus, StraitsKitchen is Halal-certified as well, making it the best spot to gather with your Muslim friends too. Just SGD 55++ for lunch and SGD 65++ for dinner? Yep, you heard us right. Find it at Lobby Level, 10 Scotts Road, Grand Hyatt Singapore, Singapore 228211. Book a table at StraitsKitchen and earn 2X Chope-Dollars with code TASTYBLOG. Don’t have your own private pool? Fret not – Oasis is about to let you have theirs! Throw the ultimate rendezvous for 10 or more with Oasis’s Private Poolside BBQ Party and leave all the grilling and roasting to a private chef. Fans of the grill are guaranteed to enjoy the seasonal menu here, with highlights such as the Australian Grass-Fed Sirloin Steak and Norwegian Atlantic Salmon and free-flowing drinks in a private cabana. Lounging with your friends by an idyllic poolside for hours on end while indulging over great grills – now THAT’S something we can definitely get with! With prices starting at $88++ per person for top-notch grills, you can hardly get anything better in town. Find it at 5th Level, Terrace Wing, 10 Scotts Road, Grand Hyatt Singapore, Singapore 228211. Book a table at Oasis Restaurant and earn 2X Chope-Dollars with code TASTYBLOG. With a breathtaking view of beautiful cascading waterfalls, enjoy 10 SCOTTS Afternoon Tea basking in elegance and serenity at the residential-style lounge of 10 SCOTTS. Serving up a pleasing mix of both local and international favourites including fresh Oysters, Curry Puffs, Parma Ham, and more, we won’t be surprised if you feel right at home at this cozy spot. If you’re feeling fancy, there’s even free flow Perrier Jouët Grand Brut champagne to help you along. Designed for diners who prefer to kick back, relax, and unwind, the 10 SCOTTS After 6 Evening Spread brings the light-hearted favourites of the afternoon tea, complete with individual dessert trays and a selection of exquisite beverages including gourmet teas and imported coffees. We haven’t even gotten to the best part: Both the Afternoon Tea After 6 Evening Spread are priced from SGD 50++ per person. Talk about a steal! 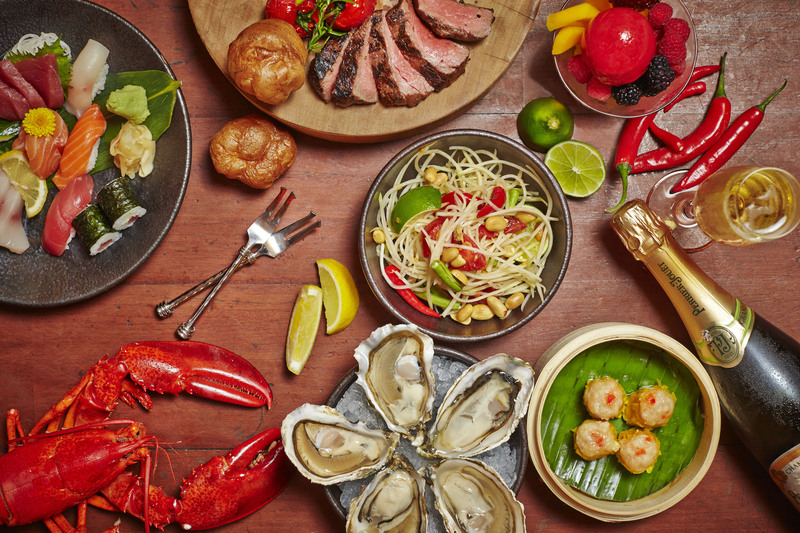 Book a table at 10 SCOTTS and earn 2X Chope-Dollars with code TASTYBLOG. The Best Festive Sale of the Year!